General Wesley K. Clark, US Army, Retired Among his military decorations are the Defense Distinguished Service Medal (five awards), Distinguished Service Medal (two awards), Silver Star, Legion of Merit (four awards), Bronze Star Medal (two awards), Purple Heart, Meritorious Service Medal (two awards) and the Army Commendation Medal (two awards), NATO Medal for Service with NATO on Operations in Relation to Kosovo, NATO Medal for Service with NATO on Operations in Relation to the Former Republic of Yugoslavia. 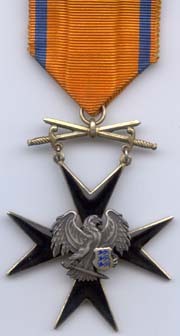 His Foreign awards include the Honorary Knight Commander of the Most Excellent Order of the British Empire (United Kingdom); Commander of the Legion of Honor (France); Grand Cross of the Order of Merit of the Federal Republic of Germany; Knight Grand Cross in the Order of Orange-Nassau, with Swords (Netherlands); Grand Officer of the Order of Merit of the Republic of Italy; Grand Cross of the Medal of Military Merit (Portugal); The Commander’s Cross with Star of the Order of Merit of Republic of Poland; Grand Officer of the Order of Merit of the Grand Duchy of Luxembourg; Grand Medal of Military Merit (White Band) (Spain); The Grand Cordon of the Order of Leopold (Belgium); Cross of Merit of the Minister of Defense First Class (Czech Republic); Order of Merit of the Hungarian Republic; Commander’s Cross, The Silver Order of Freedom of the Republic of Slovenia; Madarski Konnik Medal (Bulgaria); Commemorative Medal of the Minister of Defence of the Slovak Republic First Class (Slovakia); First Class Order of Lithuanian Grand Duke Gediminas (Lithuania); Order of the Cross of the Eagle (Estonia); The Skandeberg Medal (Albania); Order of Merit of Morocco; Order of Merit of Argentina; The Grade of Prince Butmir w/Ribbon and Star (Croatia) and the Military Service Cross of Canada. Commemorative Medal of Queen Ingrid (Dr.I.M.M.). 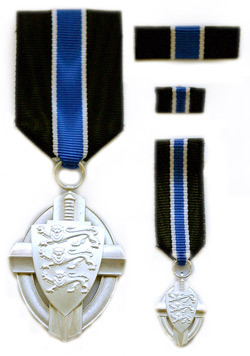 Medal of the Greenland Home Rule (Grøn.Hjst.M1). The Order of Service for the Federal Republic of Germany, Grand Cross (Ty.F.R.F.1).